Remember the 5-feet-tall Mexican scene-setters? Well, now you can make your Mexican fiesta even more Mexican (as if that was even possible) by setting up a Personalized Mexican Fiesta Arch. This beauty is not cheap, ¡no, señor! It will cost you a good $109.99 online. But don’t despair! 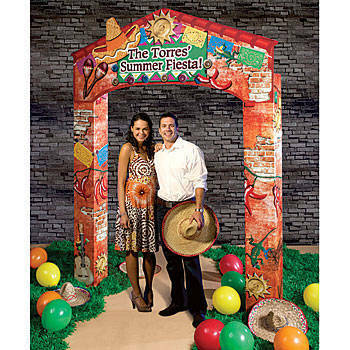 The Personalized Fiesta Arch “has the look of a brick wall along with maracas, sombreros, chili peppers and guitar accents.” Plus. It ships in only one day, so why wait for Cinco de Mayo? ¡Órale, gringo! Me querer mucho tequila! ¡Arriba, arriba, ándale, ándale! This entry was posted in Cinco de Mayo, Marketing & Advertising, Stupid propositions and tagged Cinco de mayo, fiesta, gringos, Mexican, Mexican Fiesta. Bookmark the permalink.